Everything Needed to Understand and Appreciate the Traditional Latin Mass. Fr. George Moorman. 185 Pp. PB. Extremely informative, but very easy to read! Catholics are waiting for this book! 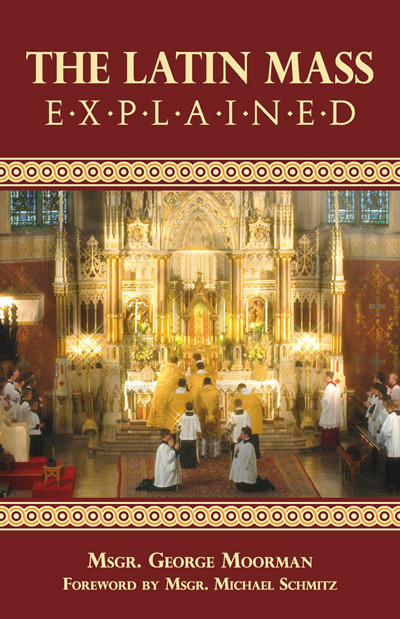 It explains what happens at the Latin Mass and why it happens, prayer by prayer. Why Latin, silence, bells, specific colors, etc.---and how we participate. Previewers are very enthusiastic! Ties in beautifully with Pope Benedict XVI's motu proprio opening the door to celebration of the Latin Mass. (ISBN-7643). No. 1880.